Henrietta Szold was born in Baltimore, Maryland, the daughter of Rabbi Benjamin Szold, who was the spiritual leader of Baltimore's Temple Oheb Shalom. She was the eldest of eight daughters. In 1877, she graduated from Western High School. For fifteen years she taught at Miss Adam’s School and Oheb Shalom religious school, and gave Bible and history courses for adults. Highly educated in Jewish studies, she edited Professor Marcus Jastrow's Talmudic Dictionary. To further her own education, she attended public lectures at Johns Hopkins University and the Peabody Institute. In 1902, Szold took classes in advanced Jewish studies at the Jewish Theological Seminary, However, its rabbinic school was for men only. Szold begged the school's president, Solomon Schechter, to allow her to study, he did only with the provision that she not seek ordination. Szold did well at the seminary, earning the respect from other students and faculty alike. Her commitment to Zionism was heightened by a trip to Palestine in 1909. She founded Hadassah in 1912 and served as its president until 1926. In 1933 she immigrated to Palestine and helped run Youth Aliyah, an organization that rescued 30,000 Jewish children from Nazi Europe. In 1909, at age 49, Szold traveled to Palestine for the first time and discovered her life's mission: the health, education and welfare of the Yishuv (pre-state Jewish community of Palestine). 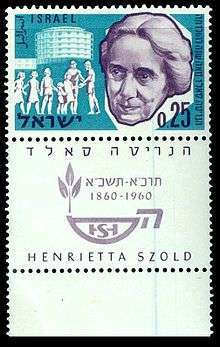 Szold joined six other women to found Hadassah, which recruited American Jewish women to upgrade health care in Palestine. Hadassah's first project was the inauguration of an American-style visiting nurse program in Jerusalem. Hadassah funded hospitals, a medical school, dental facilities, x-ray clinics, infant welfare stations, soup kitchens and other services for Palestine's Jewish and Arab inhabitants. Szold persuaded her colleagues that practical programs open to all were critical to Jewish survival in the Holy Land. "In October 1934 Szold laid the cornerstone of the new Rothschild-Hadassah-University Hospital on Mount Scopus. Szold's answer to Peretz is cited by "Women and the Mourners' Kaddish," a responsum written by Rabbi David Golinkin. This responsum, adopted unanimously by the Va'ad Halakhah (Law Committee) of the Rabbinical Assembly of Israel, permits women to recite the Mourners' Kaddish in public when a minyan is present. Szold was religiously traditional, but advocated a larger role for women in Rabbinic Judaism. In 2007, Szold was inducted into the American National Women's Hall of Fame. ↑ Shuly Rubin Schwartz (15 December 2010). "Shuly Rubin Schwartz: Standing on Henrietta Szold's Shoulders - Opinion – Forward.com". The Forward. Retrieved 26 December 2015. 1 2 "Seymour "Sy" Brody's". Retrieved 26 December 2015. ↑ Levin, Marlin (2002). It Takes a Dream: The story of Hadassah. Gefen Publishing House Ltd. p. 290. ISBN 9652293008. ↑ Henrietta Szold: Her Life and Letters, edited by Marvin Lowenthal (New York: Viking, 1942), pp.92-93. ↑ "Ha'apalah Ship Henrietta Szold". Palmach Information Center. Retrieved 26 December 2015. ↑ "Welcome". 13 July 2015. Retrieved 26 December 2015. ↑ See Szold Drive, Baltimore, Maryland on Google Maps. The years in which the houses on Szold Drive were constructed can be found in the real property records on the website of the Maryland Department of Assessments and Taxation, accessible here.